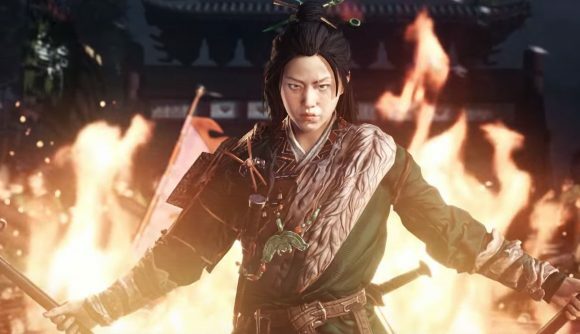 Creative Assembly has just released a new cinematic trailer for Total War: Three Kingdoms, introducing bandit queen Zheng Jiang. While the rest of the major players CA’s upcoming strategy game are vying for supremacy, Zheng Jiang wants to see the Chinese dynasties burned to the ground. The trailer, which you can check out towards the bottom of this article, opens on Zheng Jiang’s archers preparing an forest ambush, as a narrative voice announces “she’s just an outlaw.” Clearly, that level of hubris is just asking to be punished, and the unfortunate soldiers quickly find themselves at the wrong end of a bow and arrow. From the trailer, it seems Zheng Jiang and co prefer guerilla tactics – there’s an awful lot of creeping through jungles and attacking villages. But that doesn’t mean the bandit queen can’t pack a bit of a punch in open combat, as later shots show her army breaching a castle. What’s more, they plenty of artillery to back them up when they do choose to make themselves known. When it comes to Zheng Jiang herself, she’s perfectly able to handle herself in battle. The trailer closes as she walks into the fray wielding twin axes, before promptly seeing off her opponent with a martial arts combo that Bruce Lee would have been proud of. The latest outing brings plenty of tweaks to Creative Assembly’s well-established strategy franchise, from night and day cycles to the return of spies. You’ll have to wait a little while for the Total War: Three Kingdoms release date – Creative Assembly’s trip to medieval China begins on March 7, 2019, but you can pre-order it now.